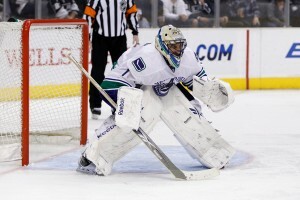 A lot has been made this season about the so called Vancouver Canucks goalie controversy. After not being able to unload Roberto Luongo during the off season, the Canucks entered the season with two number one guys in net. They have been alternating starts so far this year and Thursday night during their game with Nashville, with Luongo getting the start, TSN ran an interview with the two goalies that proved they are not having a hard time sharing the spot light. It’s pretty evident that these two guys have a pretty good sense of humor and are not affected by this ‘controversy’. Vancouver has been scuffling of late, going 4-4-2 in their last ten games but you can hardly blame the two guys in net. Their problems have been more about lack of scoring and defensive breakdowns. Schneider has been given 14 starts and has a nice goals against average of 2.63 with a save percentage of .910. Luongo has 12 starts and has an even better goals against of 2.08 with a save percentage of .917. As the video proves, neither guys is letting the uncertainty of being the number one affect their play on the ice. Will Vancouver eventually move one of these guys? We’ll have to wait and see, but it’s clear that right now both guys are enjoying their ‘controversy’.